Awe - they are just adorable!! Love their hair too! That is so sweet! Makes me wish I had a sister! Oh, I love this! Too sweet. so nice when the kids are in the mood to get along! I love sisters when they love each other. My girls can be so nice to each other when they want to be! 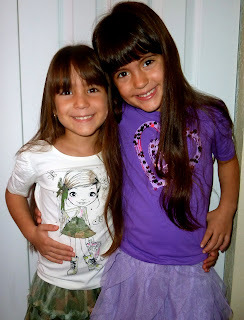 Gorgeous girls! Your daughters are so lovely, wearing those beautiful colors. Their relationship will last a lifetime! Aww my heart smiles looking at those photos. I wish my boys were close like that. I can hardly remember a time they walked hand in hand or hugged eachother without me telling them to do it. And even though it's a battle. And I'm digging the camo tutu!! What sweethearts your girls are. I just love their outfits. 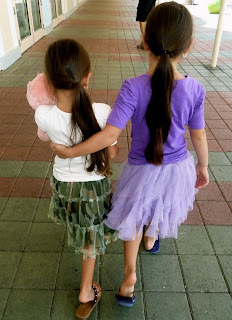 I do so love pictures of sisters holding hands and walking, not sure why, but I do.